When is aggressive behavior too much? House cats, although domesticated versions, are still relatives of the 'big cats'. And with that, still retain some of the aggressive behaviors of larger cats and wild cats. Cats, like lions, show signs of dominance and territorialism over other cats in a household, and the dominant cat will most likely be the aggressor in the house. You should never try to break up the hierarchy of your pets. However, if your cat starts to get overly aggressive with you or another cat in your home you probably should intervene and try to help the aggressive cat calm his/her ways. Remember there is a fine line between a dominant cat and an overly aggressive cat. You will know the difference by the cuts, gashes and bite markes on you and your other pets. If you feel that your cat is overly aggressive and using the simple tips below does not help, you may want to contact your vet or behaviorist. Remember it is the behavior you dislike, not the cat so don't simply rush to give your cat up for adoption if he/she is troublesome to you. Most aggressive problems in cats have very simple fixes that with a little time and energy can help your cat be the sweet, lovable pet you want. Hierarchy - In multiple cat homes a hierarchy of dominance will be set up by your cats. Usually this can be seen through how your cats position themselves vertically. Generally your dominant cat will seek out the highest possible spot to sit. You should obey these 'laws' and treat your cats accordingly. Make sure to feed, pet, or talk to the dominant cat first. Also try to favor the dominant cat slightly if you can. This may seem unfair but this is the way it works best in the cat world and what your cats have chosen. If you try to go against this system and 'choose' the dominant cat yourself the real dominator will not be happy (and will take it out on your and the other cats which will also make them not so happy) and can start exhibiting aggressive behaviors to keep his position. Territorialism - Cats are territorial creatures by nature. This stems from their ancestors who had to protect their territory in order to survive. Even though your house cat doesn't really 'need' to do this to survive he/she will still exhibit these behaviors. Make sure your cat has his/her own things (especially if you have multiple cats). Each cat should have his/her own toys, beds, areas to sleep and rest in etc. If a cat feels he/she doesn't have proper territory or if he/she feels that his/her territory is being encroached upon, aggressive behaviors may ensue. Maternal/Paternal Instincts - A cat who has just become a mother or father will be very VERY protective of his/her young. If you get between a parent and child you may see some aggressive behavior first hand! Heat - A female in heat (or a male in response to a female in heat) can become very aggressive as its instincts are to seek out a mate at any cost. Not only for the aggressive aspect, but for many other reasons as well, you should have your cat spayed or neutered when they around 6 months of age. Boredom - To think that cats are completely self sufficient and don't need us for anything but food, water and shelter is incorrect. Our pets look to us for stimulation in the form of play and talking to. In the wild you will see cats 'playing' with other cats all the time, this is actually a very important part of their day as it helps to teach them to fight and attack prey, stimulate intellectual growth, teach proper social skills, and teach coordination and timing. Your cat needs this type of 'playtime' too. You should spend at least two hours a day playing with your pet (make sure to not teach your cat roughhousing). The more you stimulate your cat's mind and help your cat learn to explore and play, the happier and more self-sufficient your cat will be. Cats who have no outlet for their 'creative energy' can become aggressive for two reasons. First it helps them release their energy, and secondly it helps them get the attention they want from us. If your cat tends to bap or scratch your feet every time you walk by or likes to jump on you and attack you for no reason, he/she may be attention starved. Illness - Many cats who have medical problems (ranging from fleas to kidney illness) will exhibit aggressive behavior. If you can't find any other reason for your cat's aggression you may want to take he/she to the vet for a full exam. Genetic predisposition - Just like humans, cats do have personalities that they have genetic predispositions for. 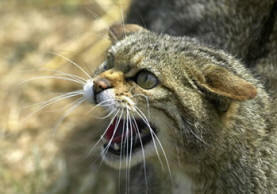 Some cats are aggressive by nature. If you have an aggressive cat you may want to minimize this aggression by making sure you treat this cat as the dominant cat, get him/her spayed or neutered, make sure he/she has plenty of territory, and keep him/her stimulated by playtime. If you feel that you have tried everything and you still have an overly aggressive cat you might consider talking to your vet about possible medications to help calm your cat. Not being properly socialized or feral – Socialization is the act of teaching a cat how to be a social animal. If your cat is the type who bites you when you come near, hates to be held or touched and who lashes out at you at every chance you may have an ill-socialized or feral cat on your hands. A feral cat is one who is considered to be wild. This type of cat was most likely the progeny of an adandoned, homeless, or feral cat and has never really had human contact. Such a cat will need to be socialized before being an acceptable pet. Domesticated cats can also revert to such wild behaviors if they are abandoned, mistreated or ignored. But don't worry there is help for such animals, they can become the pet that you desire through being properly socialized. This is not a terribly difficult thing to do but it is time consuming so be patient. Fear or redirected aggression - Many owners have been victim to this type of aggression, it occurs when the cat is already in an overstimulated/scared state and you intervene. This could occur if you try to break up a cat fight, if you try to touch your pet while he/she is stalking prey, or if your cat is already in 'fight or flight' mode. The best thing to do is to not get involved during these types of situations (unless of course you feel your cat is in danger in which you need to protect him/her). Incorrect Reading of Cat's Signals - Cats, just like humans, have different moods and they communicate these moods to us through their ears, eyes, tails, body position, voice, and fur. If your cat is in a mood where he/she doesn't want to be played with or bothered he or she will let you know. The tail might be lashing, the ears might be back etc. If you disregard what your cat is saying and try to pick up a cat or pet a cat who isn't in the mood you might find yourself receiving a little bap, hiss or scratch. The .best thing to do to minimize such situatons is to better communicate with your cat and learn to read what he/she is saying. If you do that you will know when your cat wants love and attention and when he/she just wants to be left alone.